For a Friday session, the trade of oil has been robust. End of week typically brings some hesitance to the market as institutional money is closing out their positions. However, today is seeing exceptionally high volumes. 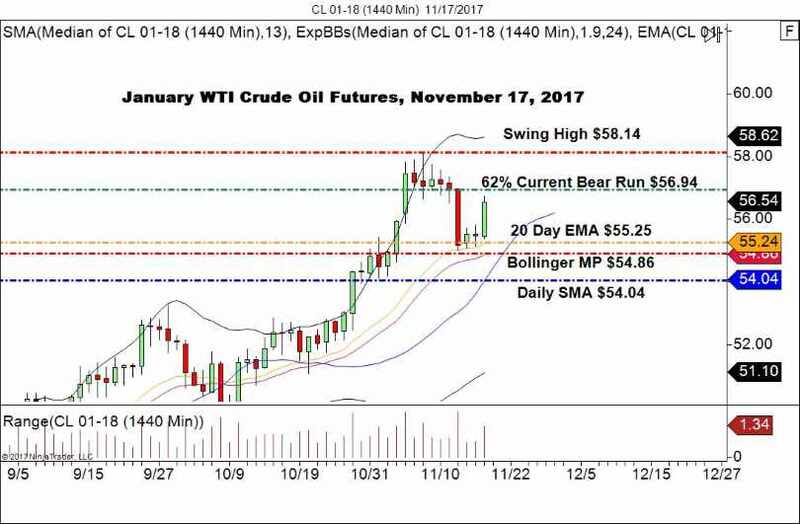 As of this writing, January WTI crude oil futures are trading trend-day up near $56.75. Congratulations to all of you crude traders that took some money out of the market on today’s winning USOIL signal. While trading CFDs is not permitted in the U.S., there is still tremendous opportunity to be had in the futures markets. The rollover from the December WTI crude contract to January is complete, with January trading near 500,000 contracts for the session. The result has been a bullish break and potential test of topside resistance. Bottom Line: Shorting a trend day in crude oil can be a recipe for disaster if not approached with proper risk management in mind. For the remainder of today, I will be shorting $56.94 using an ultra-tight initial stop of $57.04, looking for 5-10 ticks profit. If price moves in my favor 5 ticks immediately, I have no problem taking the cash and going home for the weekend! Fading intraday trends is a tough business. If you are doing so, be sure to utilize aggressive risk management!